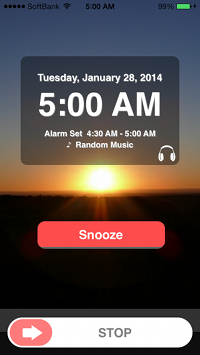 First set your alarms, snooze, volume, etc depending on your personal preference. 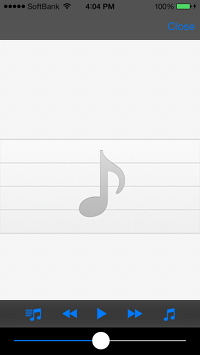 You can choose from the pre-install sounds, or iPod music, or vibration. 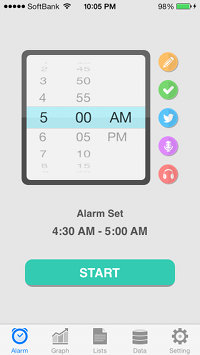 Press the START button after you set your alarm time. The device will begin to measure your sleep cycle after you press START. An alarm goes off during your shallow sleep phase a maximum of 30 minutes before the scheduled alarm. Your sleep schedule is graphed. When the alarm ring, its display shows the left image. 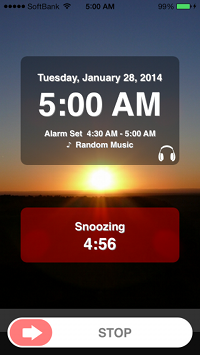 Push a snooze button or lift the device up a little bit and the device turns into the snooze mode. 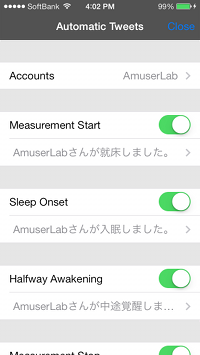 When you slide a slider to the right, you can stop measuring sleep cycles. Tap the check mark icon or note icon in the alarm menu, you can record notes or the action before sleeping. 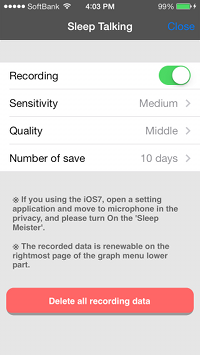 Open the recording setup in the alarm screen, when you turn on the recording function, it will be recording the sleep talking. The recorded data is renewable in the lower part of a graph screen, and a right-hand page. This is the automatic tweet function. Open the automatic tweet screen from twitter icon and select the account. When you turn on the switch each, in each timing during sleep, tweet will be posted automatically to Twitter. 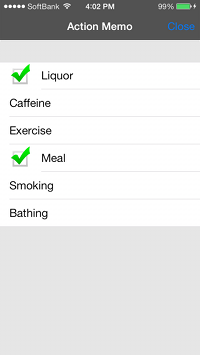 After you finished setting each function, “SET” will appear on the right top corner of the icon. 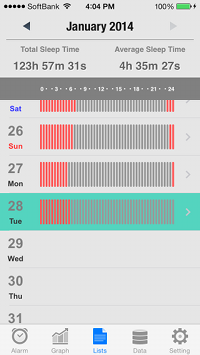 If you start measuring sleep cycles in this state, app will records notes, post them automatically onto Twitter in a preset timing, and recording your sleep talking. 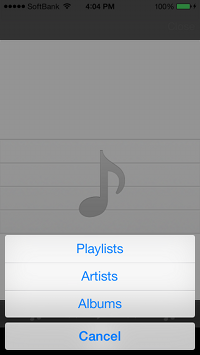 This music player supports functions of playing “playlist”, “artists”, “albums” and “repeatedly”. 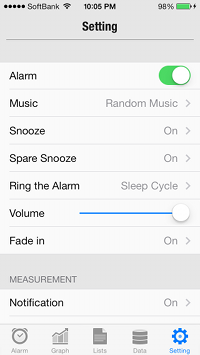 If you are listening to music measuring your sleep cycle, the music automatically turns off when you fall a sleep so that it does not disturb your sleep saving the battery. 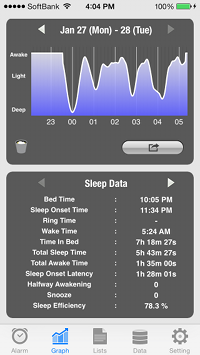 This is the graph of sleep cycle created. You can post to SNS such as 'Twitter', 'Facebook', 'Evernote', and 'LINE' from share button. 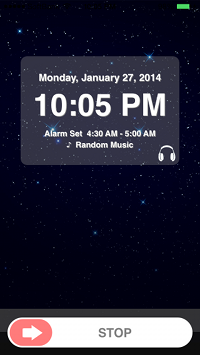 If you swipe the upper screen to the side, you can switch date. 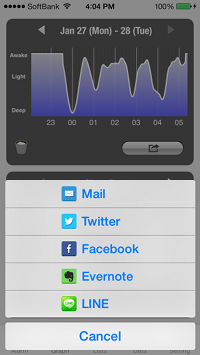 If you swipe the lower screen to the side, you can switch it to daily notes, action memo or sleep talking. 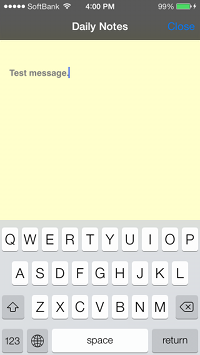 Also here you can edit daily notes or action memo. This is a list of monthly sleep. 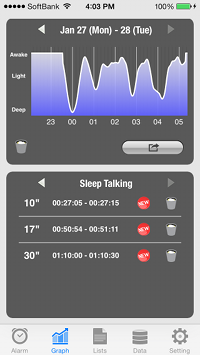 Total sleeping hours per month and average sleeping hours are displayed as well as sleep data for each day. This is data screen by week, month, and year. 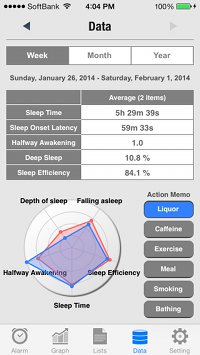 Five items of average data within a period is displayed using a table and a radar chart. 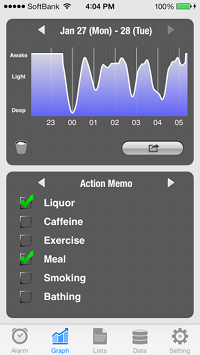 Moreover, the data according to action memo can also be displayed. 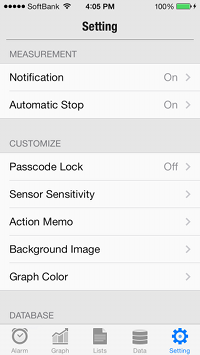 In the setting you can make various customized besides. Enjoy setting as you’d like. Copyright © Amuser Labo, All Rights Reserved.